So I was given some fake ASE about 6 weeks ago to see how they compared to the real thing as ASE are the bulk of what I tend to buy, I normally stick to current year from well-known companies but I do occasionally like to buy from their circulated/random year inventory. PLEASE be vigilant when buying precious metals if you are buying from individuals or sources you haven't fully checked out. 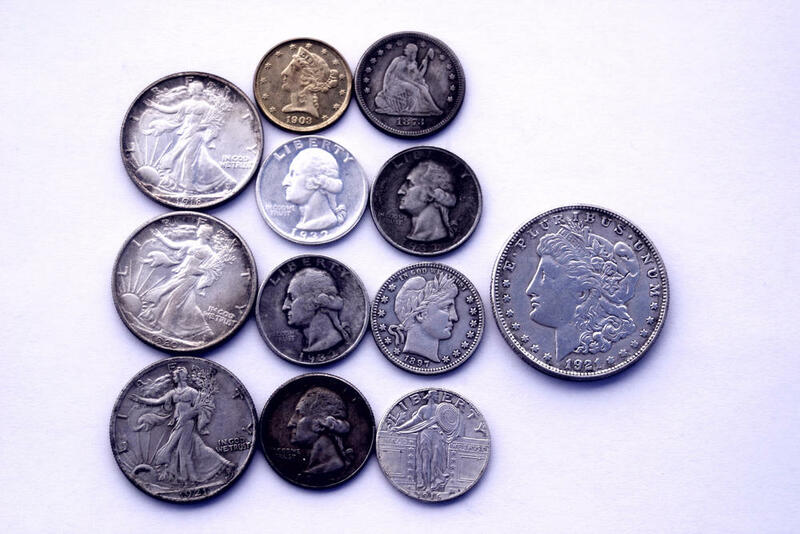 Your best bet is to stick to trusted merchants and mints, BE EXTREMELY CAREFUL buying from individuals on eBay/Craigslist or even from local coin dealers/pawnshops/antique stores. Obvious issues I immediately see... fonts, lines on the shields, the fact the obverse and reverse both have the same 'north', the tilde is wrong, detail in face/dress/hair/eagle wings/eagle neck, he size of the bullet points. All of the following are counterfeit, from this point on there are no more authentic coins. I happen to have some liver of sulfur at home from 'antiquing' a sterling silver ring a few years ago to try and match the patina in the knotwork of an identical ring I had been wearing for a decade so lets see what it does to three counterfeit coins. 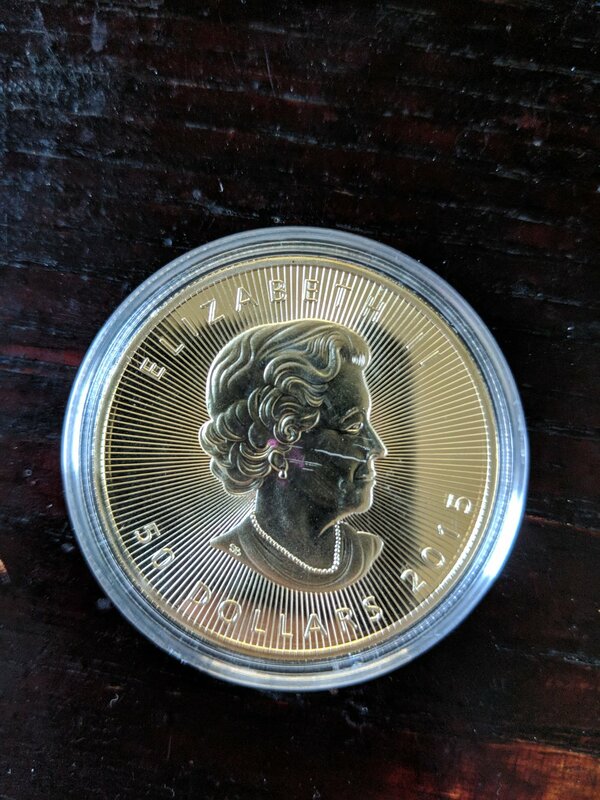 h60, a user on /r/silverbugs has posted some images of a fake bar that they found in their collection, I asked if I could add them to this post and they said sure. In the next image it's had acid poured on it, and has been cut in half. /u/silverstack91, a user on /r/silverbugs has posted some images of a fake Chinese silver panda round that they received from an eBay auction. As you can see, a quick test with acid clearly revealed it to be fake and if you look at it closely there are several red flags in the design compared against images of known authentic 2008 rounds. /u/idratherbgardening a user on /r/silverbugs has posted some images of a fake Chinese silver panda round that they received at a coin show. Last year I purchased a unique bar with the Ryan’s Rust Mint mark on it. Having studied it first, it was a “prototype” bar that was created and on display on the Ryan’s Rust Mint website, which is now defunct. Upon receipt, it was immediately suspicious due to its non interaction with a neodymium magnet (it barely held when slid down at any angle). This of course was not surprising at this point, but far from the 999 stamp included on the bar. My guess is that a 1oz non-silver coin was included in the melt, whether by ignorance or intent (to pad profit margins, for instance). I contacted the maker, who is also a member of this community, and he responded quickly. However, no reasonable explanation was given (blaming Apmex was the main one...) and when asked if he could exchange this bar so it could be returned and destroyed, giving him the benefit of the doubt, he flatly refused. I am making no judgement on the maker, I however am providing this information to the community that this bar (shown in attached images) is fraudulent and that if you have a Ryan’s Rust Mint bar, you should also have it checked or read this post before purchasing or selling one. Thanks to everyone for the feedback. I have drilled the bar and it is consistent throughout. There is no yellow core. It is likely 88% silver throughout. Thank you for the advice! Here is the X-ray fluorescence test. The bar is Ag = 88% Zn = 4% Cu = 8%, clearly not .999 silver. Fake Chinese panda 2017, Fake 1929 St. Gaudens, Fake 1888 CC Morgan, Fake Trade Dollar (reverse is NOT a trade dollar reverse), Fake 2015 Gold Maple. /u/whineknot had a suspect one ounce bar, after cutting it in half they determined it was absolutely fake. Here’s a really cool specimen that Reddit user /u/55_grain received, the original thread can be found here. It’s a fake standing liberty quarter that appears to be made out of pot metal (probably some zinc alloy), the texture is pretty indicative of casting and it definitely has the pot metal appearance. The specimen weighs in at 4.17 grams, as the user indicates approximately 70% the weight of a natural one which lines up with some sort of zinc alloy. In the first photo we see the weight at 64.4 grains (4.17305 grams). In the following 2 images the specimen, if not obvious, is in the bottom middle position. The above specimen might actually be a considerably older counterfeit and not a recent production, possibly a Depression-era counterfeit. A (probable) example of a Depression-era counterfeit can be found documented in a Numismatic Guaranty Corporation article https://www.ngccoin.com/news/article/1674/ documenting a counterfeit 1924-S Standing Liberty Quarter that also has a very distinct, although more warn, pot metal appearance. More fake silver bars have been brought to light by /u/Thatsgemmy, you can find the original thread HERE. What initially makes me suspect about these is the mirror-like finish as it is a bit over the top for a generic bar, especially with the frosted/textured lettering. Counterfeit Northwestern Territorial Mint silver bars.